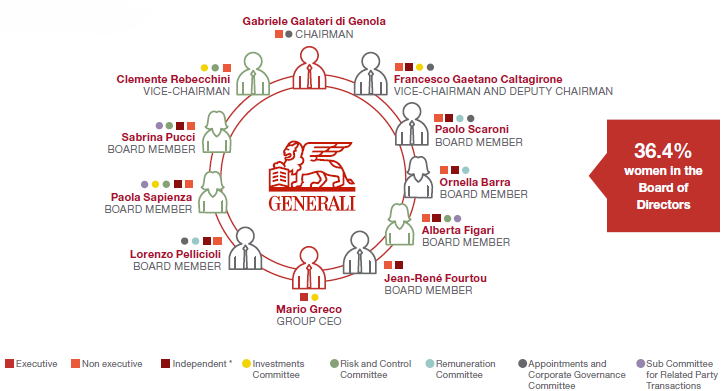 The corporate governance system of Assicurazioni Generali is focused on the objective of creating sustainable value over the long term. To achieve this objective, the Company is committed to the pursuit of excellence within the corporate organisation. Safeguarding the robustness, reliability, transparency and professionalism of the Company, combined with an effective business strategy, constitute the system of values the Company has built to pursue its objective of understanding and satisfying the needs of its stakeholders. The Board of Directors of the Parent Company is the body responsible for developing strategies and policies, setting the Group sustainability objectives and commitments, as well as assessing the related risks, opportunities and areas for improvement. The Risk and Control Committee, established within the Board of Directors, is assigned consultative, recommendatory and preparatory functions to assist the Board on social and environmental sustainability matters involving the Company and the Group, functions that were previously carried out by the existing Social and Environmental Sustainability Committee. The Risk and Control Committee is composed of four directors, including three women (75%). * As defined in the Self-Regulatory Code. Responsibility for CSR at Group level is attributed to the Group CEO, Mario Greco, who is charged with implementing the strategies and policies established by the Board of Directors. the CSR Committees, i.e. operational bodies at national level that interact, on the one hand, with the Sustainability Committee to ensure the coordination of efforts and ensure the transfer of local best practices to an international level, and, on the other, with local Group companies with a view to duly implementing the decisions taken by Head Office. The CSR committees are chaired by a member of the local Top Management and involve the Corporate Social Responsibility Officer and the heads of the departments most involved in implementing social and environmental policies. Corporate Social Responsibility, i.e. the unit responsible for all activities related to sustainability, both within the Group and with regard to the market, reporting to the Group CEO through the Head of Group Communications and External Relations.